Earth is in danger! The only things that can save our planet are six essential elements scattered throughout the galaxy. 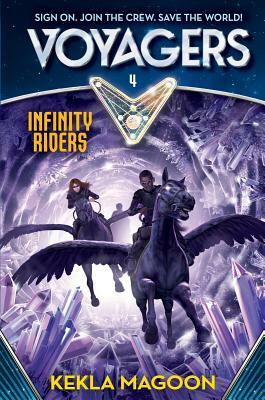 And it is up to the Voyagers—a team of four remarkable kids and an alien—to gather them all and return to Earth. On the fourth planet, Infinity, the Voyagers journey deep underground, through a complex maze of tunnels. The tunnels are full of alien life—and danger. And before they can escape, one of their own will be taken from them. . . .
KEKLA MAGOON is the author of five young adult novels: How It Went Down, for which she received a Coretta Scott King Honor, Camo Girl, 37 Things I Love, Fire in the Streets, and The Rock and the River, for which she received the Coretta Scott King New Talent Award and an NAACP Image Award nomination. Raised in a biracial family in the Midwest, Kekla now teaches writing in New York City, conducts school and library visits nationwide, and serves on the Writers’ Council for the National Writing Project. She holds a BA in history from Northwestern University and an MFA in Writing from Vermont College of Fine Arts. Visit her online at keklamagoon.com.